On Sunday, February 3rd at 6:30 pm EST, more than 100 million people are expected to tune in to watch The Los Angeles Rams take on the New England Patriots. Super Bowl LIII is taking place at the Mercedes-Benz Stadium in Atlanta, home of the Falcons! This will be the first time the stadium, which opened in 2017, will host a Super Bowl. Atlanta is expecting an estimated 1 million visitors over the weekend. Did you know Super Bowl Sunday is considered to be an unofficial American Holiday? Yeah, we didn’t either. So we decided to check out just how American-made this unofficial “American holiday” really is. We did some digging and put together some fun facts about the Big Game along with some details on just how American-made the event is. The most watched Big Game was XLIX. The Patriots’ last-second victory over the Seahawks was the most watched in television history with an estimated 114.4 million viewers. The Super Bowl has been moved once: In 1993 after Arizona voted against recognizing MLK Day as a national holiday. The Mercedes-Benz Stadium opened August 26th, 2017. This is the first time Atlanta is hosting the Super Bowl at this stadium, but it will be third Super Bowl played in Atlanta. The Cowboys beat the Bills at the Georgia Dome in 1994 and the Rams beat the Titans in 2000. Made in USA Fact: The NFL uses 72 game balls during the Super Bowl. Each and every football is specifically made just for the Super Bowl by Wilson, an American manufacturer. Yes, you read that right. 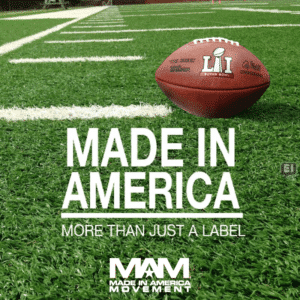 Each and every football has a Made in USA tag on it! The footballs are all made by hand at the Wilson Factory in Ada, Ohio. In fact, all of the footballs used during the NFL season are provided by Wilson! Super Bowl XXVII was one of the more sloppy Super Bowls ever played. The tilt between the Cowboys and Bills featured 12 (!) fumbles, eight by Buffalo and four by Dallas. The largest crowd in Super Bowl history dates back to 1979. Played in Pasadena, the Rose Bowl packed in over 103,985 fans to watch the Steelers versus the Rams in Super Bowl XIV. The player with the most Super Bowl rings is Charles Haley, who has won five playing for the 49ers and the Cowboys. The most watched halftime show was Katy Perry and the infamous Left Shark’s halftime show at Super Bowl XLIX. It drew, even more, viewers than the game itself. Her performance was watched by 118.5 million people. The NFL did not turn to pop acts for the halftime show until 1991. Before then, it was largely comprised of marching bands. The New Kids on the Block performed in 1991. Halftime performers are not paid in money, only in exposure. Three teams have been to the Big Game eight times: The Cowboys, Steelers, and Patriots have appeared in an NFL-record eight Super Bowls. In fact, the Cowboys and Steelers have matched up against each other in three Super Bowls. Made in USA Fact: The Vince Lombardi trophy is awarded to the winner of the Super Bowl each year. It is made by American manufacturer Tiffany’s and Co. in a silversmith out of Parsippany, NJ. The trophy stands 22inches tall, weighs 7 pounds and depicts a football in a kicking position on a three concave sided stand. It takes about four months to make, it is entirely made of silver and it’s worth $25,000. Unlike trophies such as the Stanley Cup and the Grey Cup, a new Vince Lombardi Trophy is made every year and the winning team maintains permanent possession of that trophy, with one notable exception being Super Bowl V‘s, won by the then-Baltimore Colts. Raiders QB Rich Gannon set the Super Bowl record with five interceptions in a single game against the Tampa Buccaneers. As Don Shula was being carried off the field after the Dolphins’ Super Bowl win in 1973, a fan reached up to shake his hand and stole his watch. The seven most-watched American television broadcasts have been Super Bowls. The last time the Big Game was in Houston was during NIPPLEGATE! Justin Timberlake pulled off a piece of Ms. Jackson’s top which exposed her breast. Wardrobe malfunction? We will never know. In 1980, the Steelers were the first Super Bowl-winning team to visit the White House. They visited with Jimmy Carter in a joint ceremony with the Pirates who won the 1979 World Series. Peyton Manning is the only quarterback to start and win a Super Bowl with two different teams. Five players share the record for most points scored in a Super Bowl. Four of them are 49ers. Two of them came in the same game when Ricky Watters and Jerry Rice both scored 18 points in Super Bowl XXIX. Phil Simms was the first Super Bowl MVP to say he was “going to Disney World.” He did so after completing 22 of 25 passes in Super Bowl XXI, setting the record for highest completion percentage. No team has ever been shutout in the Super Bowl. Miami scored the fewest points when it only mustered three in Super Bowl VI against the Cowboys. 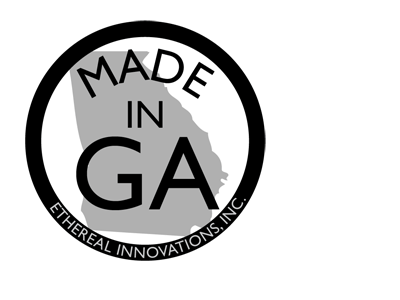 Made in USA Fact: The big game cannot start without the Coin Toss. And guess where the coin is made? Yes. You guessed it! The coin used at the Super Bowl is made by American manufacturer Highland Mint based out of Melbourne, FL. They are a full-service mint with state-of-the-art facilities housed within their 40,000 SQ foot building. They take a job from start to finish providing layout, design, and processing of precious metals, among other services! Don’t worry, the collectible Super Bowl coins are also Made in the USA. Coin Toss: Heads have turned up 25 times while it has landed on tails 27 times. Ravens kicker Matt Stover was the oldest at 42 years and 11 days. The first two Big Games were not even referred to as the Super Bowl at the time. It wasn’t until Super Bowl III that the name was coined. Not all watching are fans. Some watch as part of a Super Bowl party. Others watch for the commercials. Ads sell for $5M to $5.5M for just 30 seconds of air time! That’s more than $183,000 per second. During Super Bowl I in 1967, NBC was still in airing a commercial when the second half kicked off. The Packers were asked to kick off again by officials. Pizza Hut is estimated to sell over 2 million pizzas in Houston this Sunday. That’s enough pizza to cover a couple of football fields. New England is 5-5 in Super Bowls. The Patriots lost in 1986, 1997, 2008, 2012 and 2018. They won in 2002, 2004, 2005, 2015, and 2017. Fans will chomp down about 1.23 billion chicken wings, over 8 million pounds of guacamole and about 14,000+ tons of chips will be consumed. About 52+ million cases of beer are sold on Super Bowl Sunday. The record for the largest crowd for a Super Bowl was set in 1979 when 103,985 fans watched the Steelers upend the Rams at the Rose Bowl. Made in USA fact: Most of the helmets worn by the NFL players are manufactured by two companies: Riddell and Schutt Sports! Both are American manufacturers. Both provide almost 100% of the headgear used by the NFL. This will be Patriots 11th Big Game appearance. Joe Montana not only emerged victorious from all four of his Super Bowl appearances, but he also did it without throwing a single interception in any of those games. Ben Roethlisberger had a 22.6 passer rating in his first Super Bowl win. That’s the lowest rating for a winning quarterback in history. According to the USDA, Super Bowl Sunday is the second-largest food consumption day in the USA. Thanksgiving is the first! Player to throw the most interceptions in one game: Rich Gannon of the Raiders. He threw five interceptions, contributing to the Buccaneers’ Super Bowl XXVII win. Gladys Knight will perform the national anthem this year. The Pittsburgh Steelers has won the most Super Bowls with a total of six wins. The Patriots have won five Super Bowls, all of them with Tom Brady and Bill Belichick at the helm. New England tight end Rob Gronkowski has 1.7 million Twitter followers. Sadly, this star is injured and will not be playing for New England during the Big Game this year. The highest winning score was during Super Bowl XXIV on January 28, 1990 – San Francisco 49ers, 55, Denver Broncos, 10. This was also the largest margin of victory to date. Atlanta kicker Matt Bryant, 41, will be the oldest player in the game. Second oldest is New England’s Tom Brady, at 39. The oldest Super Bowl-winning QB is Peyton Manning, 39, winning Super Bowl L against the Denver Broncos. Tom Brady and Bill Belichick are the first QB and coach to appear in seven Super Bowls. NFL record. Joe Montana won the Super Bowl Most Valuable Player (MVP) award three times. Tom Brady has won it four times. The Patriots started in 1959. The Falcons were created in 1965. Both teams chose their nicknames via a public contest. The Browns, Texans, Jaguars, and Lions have never been to a Super Bowl. Detroit, Jacksonville, and Houston have all hosted a Super Bowl, however. Poor Cleveland. Did you know some of these facts? Do you have some facts to share with us? Let us know in the comments below! I would like a list of dishwashers that are sold at sears that are made in the USA. Union Yes! !